Specialized’s Body Geometry grips look comfy, with their additional wrist support; the drawback is they lock your hands in a single position. The Evo tag on a Specialized usually rubberstamps it as a bike designed for more aggressive riders. 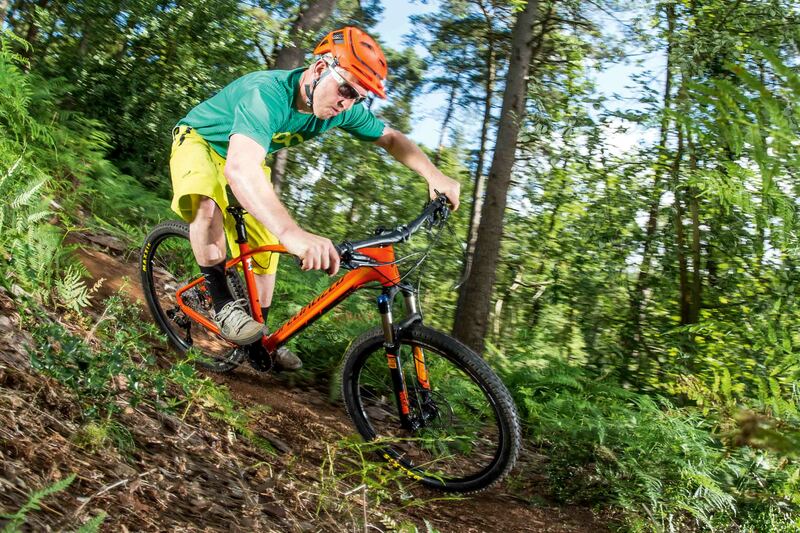 Wider bars, more travel, better tyres — all go part and parcel with the Evo attitude — and the specification on the 650b Rockhopper hardtail is no different. Even with its bespoke alloy frame, the Rockhopper’s geometry leans more toward XC than trail riding. It doesn’t have much in the way of stand-over clearance either, at least not on the size L, so the bike instantly felt more cumbersome than we thought it would. Also, because the top tube has been flattened, if you clip your knee on its angular profile when cornering or getting loose, it’s surprisingly painful. A feature we really like on the Rockhopper are the bridgeless stays. Not only do they offer tons of tyre clearance, they also make it much harder for mud to collect on the frame. 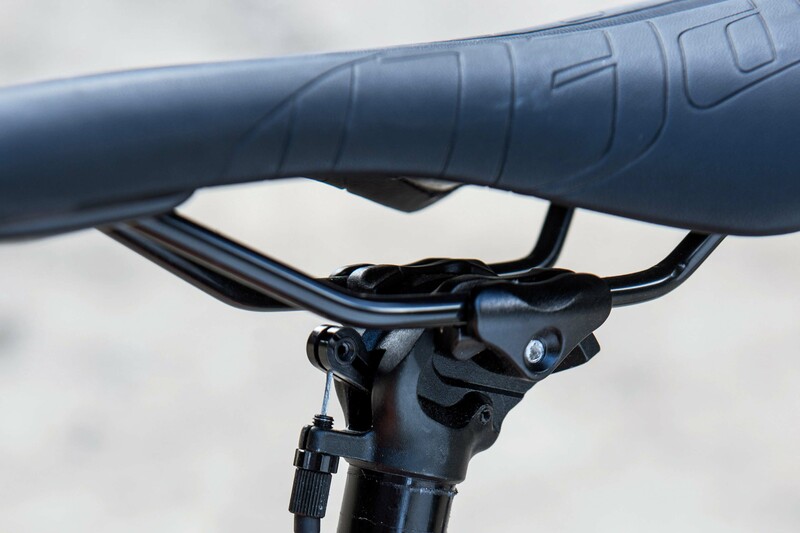 The rear brake caliper is neatly concealed between the seat and chainstays, and thankfully it doesn’t push the stays out so far as to cause heel-rub. Specialized’s full-suspension bikes all get custom rubberised chainstay protectors, but there are no such luxuries on the flagship Rockhopper — which is a real shame. So, even with the SRAM X9 Type II clutch mech helping stabilise the chain, the bright orange paint on the chainstay was chipped and tatty after the very first ride. Not cool. In keeping with the Evo theme, the Rockhopper gets a RockShox XC32 fork with 15mm Maxle lowers and a tapered steerer for improved stiffness and security. 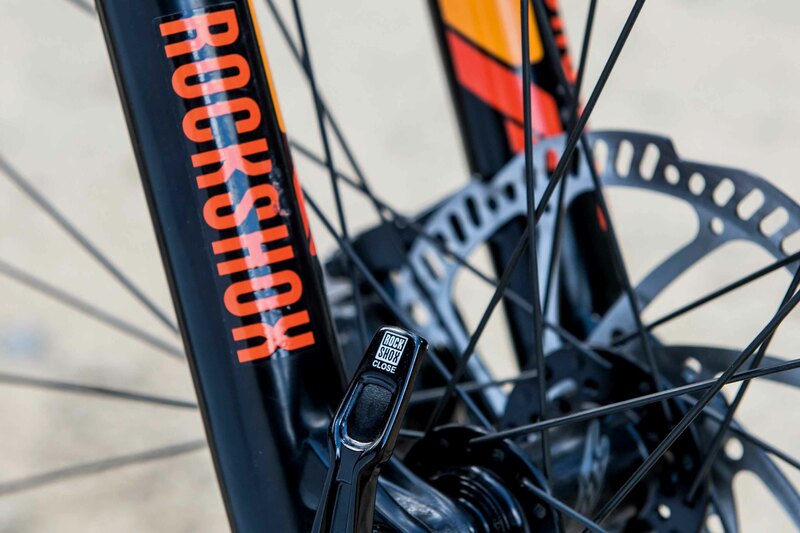 Travel has also been pumped up to 120mm — the regular 29er Rockhoppers have 20mm less. The chromed steel upper tubes on the XC32 aren’t the lightest, but the surface finish is incredibly smooth and hard-wearing, so the fork has great small-bump sensitivity and should prove very durable. Being able to drop the saddle by 100mm at a moment’s notice really boosts confidence when tackling more challenging terrain (on what essentially amounts to a pumped-up XC bike), so top marks must go to Specialized for fitting a dropper seatpost to the Rockhopper. Equally impressive were the Tektro Gemini Comp brakes. It was super-easy to get the levers exactly where we wanted them, and once the pads bedded-in, we enjoyed one-finger braking all the way. Obscured by the Tektro brake levers are SRAM X5 shifters. 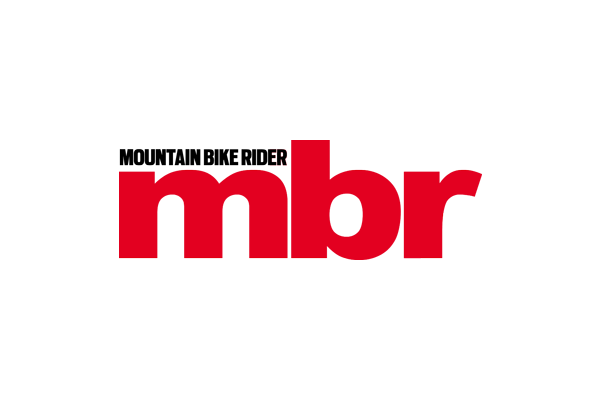 They are a couple of rungs down the SRAM hierarchy from the show-stopping X9 rear mech, and while the shifters never missed a beat, they do have a more laboured action than equivalent-level Shimano units. The Ground Control tyres on the Rockhopper left us scratching our heads, as they didn’t seem to offer much in the way of grip, yet they also felt very draggy. On swapping them for our Maxxis control tyres, we noticed that they had relatively rigid, Flack Jacket puncture resistant strips under the tread, to protect from thorns and glass. Unfortunately, this also made the tyres much harder to deform, which accounted for the increased rolling resistance. 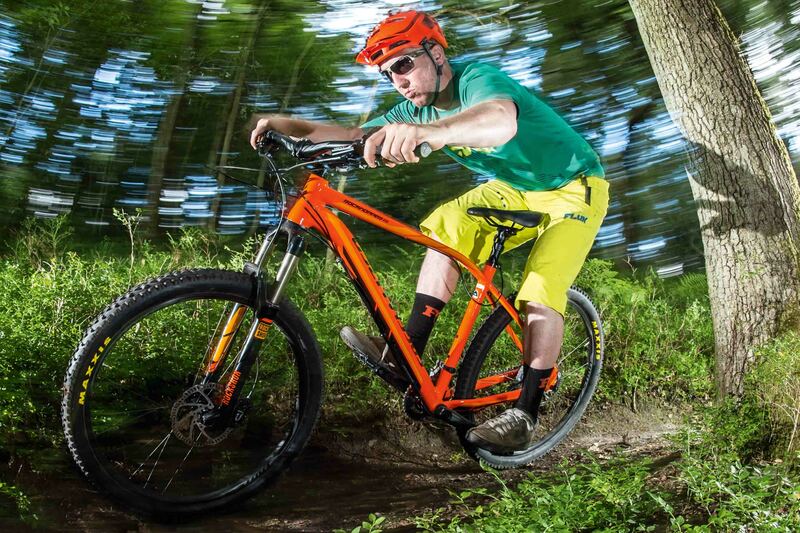 The lightweight alloy Rockhopper frame offered a reasonably comfortable ride, and while it plods along at a steady click, it’s only when you hit a climb that you get an injection of enthusiasm. Power delivery is great as you crank onwards and upwards, and it was easy to keep the front end down. 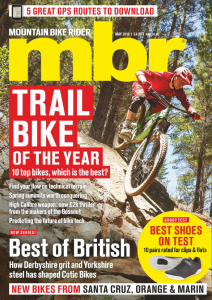 Good as that is, it’s too one-dimensional for us, and elsewhere the Rockhopper failed to inspire us to really attack the trail in the way the best hardtails do. In that respect, the Specialized Rockhopper Pro Evo didn’t really live up to its Evo billing. Yes, it gets a wider bar, a bolt-thru fork, beefy tyres and a dropper post, but these are just sprinkles of glitter on an otherwise lacklustre bike. It may have the Evo tag and build-kit to match, but Specialized seems to have forgotten to instil the Rockhopper Pro with the all-important Evo attitude. Not once did we feel like we could push our limits, and we always felt more like a passenger that was simply along for the ride. It’s definitely a suitable companion for racking up miles, or working on your fitness, but there are literally thousands of hardtails that do just that. 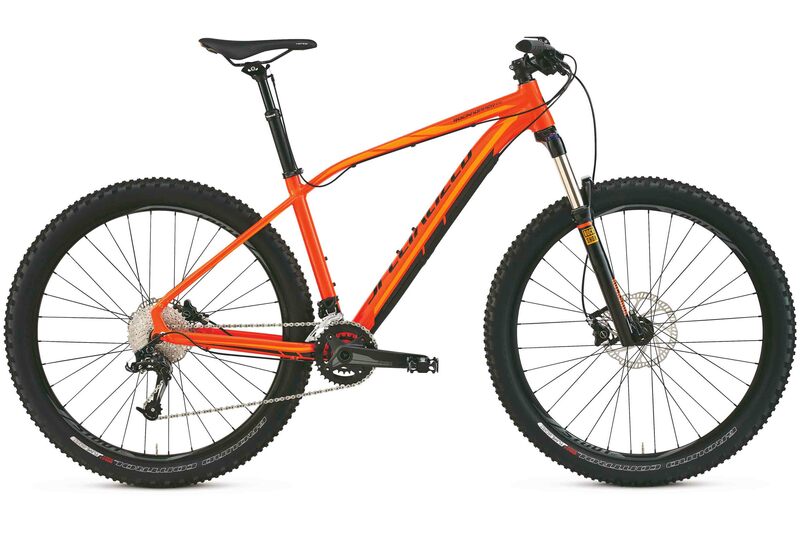 Specialized is going to need more than a bright orange finish if it really wants the Rockhopper Pro Evo to stand out from the crowd.